It’s the time of the year to watch your cricketing warriors and cheer for their victories. This IPL season don’t hold back, bring out your inner fan and experience the thrill right at your home with Mitashi Edutainment’s Television line. If theatre like experience is what you are looking for then the curved range of TV by Mitashi is perfect for you. This cricket season simply get yourself an immersive viewing experience with Mitashi TV and immerse yourself in the game. Gear up and wear your team’s jersey hold on that popcorn and watch the IPL action unfold in your living room with Mitashi’s Curved LED TV range which gives you lifelike experience while watching a super energizing match at home with your friends on Mitashi’s range of Curved LED TVs with sizes like – 32-inch and 39-inch. If you want an even more immersive viewing experience, then Mitashi’s 50-inch and 55-inch curved LED TV is your thing. Enjoy the 4K picture quality and sound quality to experience the sound of victory as strong as it would sound in the stadium, when your favourite team wins. Rakesh Dugar, Chairman and MD – Mitashi Edutainment Pvt. Ltd. said, “Mitashi is working towards creating immersive viewing technology. 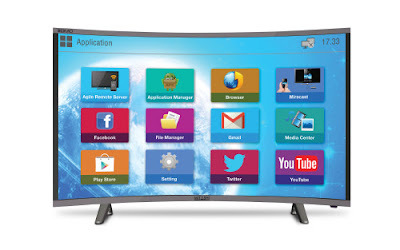 Taking this vision forward, we launched a whole new range of Curved, Smart LED TV’s for smart world. Our association with Rajasthan Royals for this 6thtime during IPL has made it an important part of the Mitashi family as it is an integral part of so many people who would watch IPL every year at their homes comfortably due to our innovations, like an immersive viewing experience with Mitashi’s curved LED range this year. The curved screen makes the image more real, gives the wider field of view, greater depth, sharper images and richer contrast that further accentuate the viewing. Our product innovations are bound to transform the way you experience television. Bring it home, and see how your world changes!” The IPL season is the best time to be entertained at home with your folks in the comfort of your sofa with the best from Mitashi Edutainment.